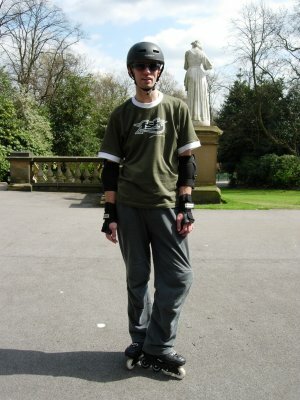 The first time I wore in-line skates was at the YMCA in Halifax, probably around 2004. My daughter, Imogen, was invited to a skate party there. I went along and, of course, had a go. We starting going to the Friday evening sessions. We got our own skates and went every week until she was too old to be allowed into the junior sessions. I got a pair of aggressive skates and had a go, somehow avoiding serious injury. I got Elliot (my son) a skateboard, but I fell too many times. So I’ve stuck with my blades and now practice freestyle whenever I can. In early 2013 I bumped into Lawrence, who I know from our YMCA days. He told me about The Skateful Dead roller derby team. Well, old dog, new tricks….